I have totally weirded you out but intrigued you at the same time, haven’t I? So there I was. The morning of my husband’s birthday. He was happily sleeping in and I knew I wanted to surprise him with a tasty but different breakfast in bed. When I looked in the fridge the cream cheese completely caught my eye. Do I think of making some sort of bagel with a custom flavoured cream cheese like a sane person would? No! Instead I begin pondering how a breakfast cheesecake would be done. In the morning, before coffee or tea, a cheesecake pancake is ofcourse the logical answer. Feeling a bit like a kid mixing up a possibly monstrous concoction to surprise the parents with, I get to work. Then, a miracle happened. I served it with a choice of strawberry jam or maple syrup…and it was delicious!!! Decadent yet light, and oh so filling. Cheesecake for breakfast…the world is now perfect. You are welcome, I await my nobel prize. Hehe. Combine the cream cheese, splenda/sugar, cinnamon, vanilla and coconut flour in a bowl. In a seperate bowl beat the egg whites until soft peaks form. Fold the egg whites into the cream cheese mixture carefully. Spray a pan and heat over medium low. Spoon about 1/4 cup onto the pan. Allow to cook about 2 minutes on each side achieving a golden brown. If they are a bit dark, don’t worry! It’s cheese, it remains tasty…unless you’ve completely burnt them. Makes 4 pancakes. 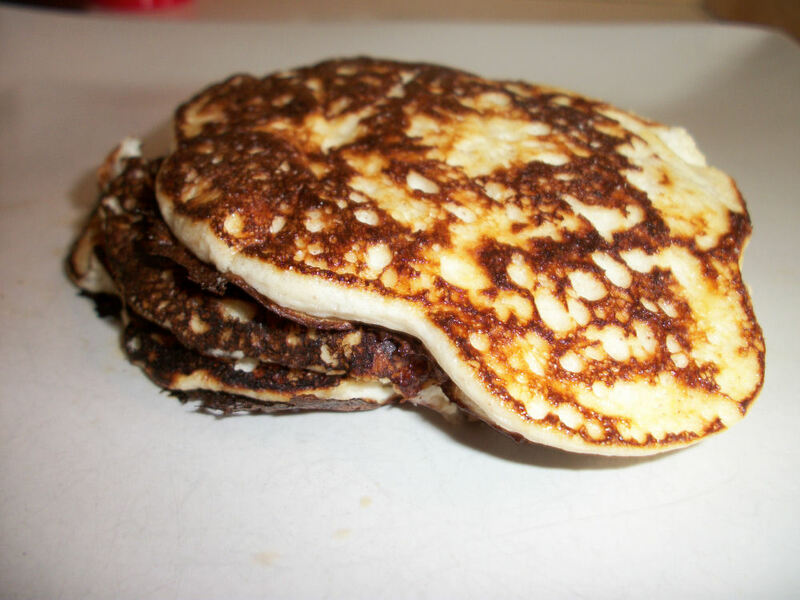 Each pancake contains 86 calories, 5.3 grams fat, 5.3 grams carbs, 1 gram fibre, and 6.8 grams protein. Absolutely delicious served with fruit, jam and maple syrup. I think this may even be gluten free…double check that though with your resident gluten free person, I am not a gluten free expert. This entry was posted in Breakfast, Comfort Foods, Dessert and tagged Cheese, Cinnamon, Egg. Bookmark the permalink.